I have partaken in the demise of many bottles of this inexpensive wine. The first swig of this wine, whether from a fine crystal wine glass, a proper water glass, a Styrofoam cup or straight from the bottle, signals that it is cheap. My head does not hurt in the morning after drinking this wine the previous night. While this might not be a factor in a mark of excellence it does give this wine a passing grade. Many wines in the inexpensive world do have questionable after-tastes. This wine has a very distinct and strong initial smack on the taste-buds. The after-taste is fine. This wine should be chilled. It does not go off to bad when it gets warm, but the initial flavour does get more bold and forceful. There used to be a thing called reality. We as a society used to agree that some things were real and some things were not. And here I am watching reality in a hotel. Namely RU faster than a Redneck? Is this better that Extreme Couponing? The Storage Wars? Or anything with those celebrities. I bought this album in Ukraine. I did not overpay. I believe I shelled out about 20 cents for this album at the Universal Store (Univernah) on Kyiv’s main street Khreshchatyk. The currency crisis was insane in Ukraine in the early 90s. I suspect that this album is a pirated copy, since it was made in Vilnus, Lithuania. Perhaps that company had the rights? It was one of several records that I picked up and is one of my favourites. 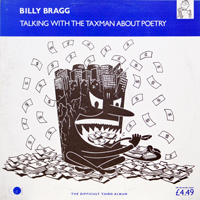 Many people dismiss Mr. Bragg by saying his songs are overtly left-wing political. There is a bit of that but it is really not much of a distraction – except for “There is Power in the Union” – that is a very overt signal but a very well executed and powerful song. Most people have not heard this song and should listen to this version. Although there are some backing musicians on this album, notably Johnny Marr from The Smiths and Kirsty MacColl, Kenny Jones of the Small Faces and The Who, among others, the music is sparse on this album. It has a great vibe. Is this just a marketing trick? Is this just a cheap attempt at raising the price on an inexpensive wine? Is this wine really that much better than the regular Fusion? Is it worth the extra two bucks that it commands than the regular Fuzion Malbec? Not worth the two bucks. If you are into the Math stuff that is a 25 percent increase in cost. It is not 25 percent better. Honestly it is very much the same. A good standard wine. I like it – this Alta wine – but I will buy the regular one next time. A casualty of this information age is that we rarely have time to think. There is so much of interest going on in the world that I am consuming this information at a voracious rate. Professionally I have been immersed in the world of lasers, and manufacturing, and welding, and robots and steel. It’s not a bad place to be. I made it all the way to Mississauga. I use this as the background image on my computer. I was on a ferry in the Baltic sea in the midst of a storm. It is funny that it really does not look too bad. I was on the top deck, at least five stories above the water and was getting sprayed when the ship hit the wave. 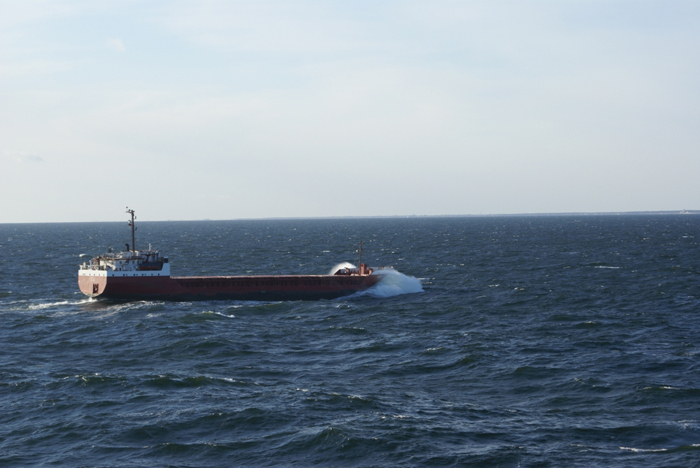 This freighter sped past us early in the voyage. The bow of the ship, which is about two to three stories above the water is buried in the sea. I got this album for one reason only. To protect myself, and my loved ones, from Martian attacks. It was Slim Whitman’s yodelling voice that caused the Martian heads to explode in Mars Attacks! It was a very good movie and who was I to argue with the logic. I have listened to this album several times back to back and my head is about to explode. It is very romantic/shmaltzy music here. This is an album of standards of the time. 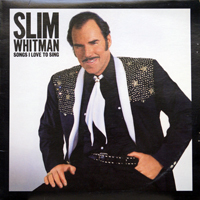 Reading the producer’s notes on the back cover of this album he explains that there are a few of Whitman’s hits and some other hits that he has admired. The album has the sound of middle-of-the-road North American AM radio of the early to mid-seventies – just as rock-and-roll was taking over. The album was released in 1980 – as punk was breaking out. Timing is everything. There is no doubt Mr. Whitman has a great voice. I love the yodelling. He does not do it enough on this album. I want more yodelling.